Rachel Harrie is hosting another Writers Platform-Building Campaign (for which, in my humble opinion she deserves unlimited kudos), and I am looking forward to participating again. These campaigns provide participants with a safe environment to test the boundaries of their creative comfort zones…and if you’re anything like me, you have to be coerced, conjoled, or flat evicted! They also help increase blog traffic by introducing everyone to other like-minded writers…not to mention other unlike-minded writers, which is even better! I’m looking forward to the first challenge – which I equate with a roller coaster ride (not an original metaphor, but apt). I get in with shaky knees and a queasy stomach, the whole time mentally cursing whoever talked me into doing it. Posted on February 10, 2012, in Mulligan Stew. Bookmark the permalink. 19 Comments. I know I’m proud of you! I don’t even write letters or private journals much less a blog or anything others might read! Good job, Cindy! Nice to meet you, fellow campaigner! Stopping in from the campaign! I’m looking forward to knowing you better through your writing! Hi, Cindy. Thanks for visiting my blog. Hope we get a chance to get to know each other better. I am glad I found your blog and I look forward to more of your posts and seeing you tear up the blogosphere. This is my first campaign, so I’m excited to get started and meet other writers. Looking forward to getting to know you! Thanks for stopping by my blog earlier. You’ll be fine. Putting yourself out there isn’t an easy task, but you’ve done it! Look forward to seeing more from you. Can’t wait to see what the first challenge holds! I’ve got permanent custody of my son’s Boston Terrier. An then, we’ve got what looks to be a Corgy and something mix…no clue what her geneology might hold! PS How did you get the campaign badge on your site? I also use WordPress and being quite lame couldn’t figure it out. Rossandra…Have you been successful getting the badge posted? If not, I right click on it, click on properties, copy the URL and post it to my widget thingy on my dashboard. Hope this helps. There’s bound to be more than one way to skin this cat, but this is how I do it. Thanks Cindy, I tried that and just get a bunch of code on my page! I shall persist. 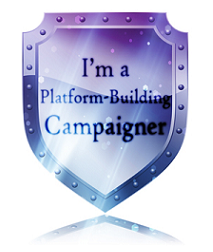 I’m also a campaigner. But I’m a little confused about the challenges. How will I find what are the challenges? can you guide me through a little. I have visited the blog as well but still I’m confused. The first challenge starts 2/20…go to her website and it will be posted there at that time. Good luck!! Hi, another fellow campaigner, thanks for stopping by at my blog earlier. Looking forward to reading your work. It’s me again. This time with great news. You’ve been tagged! (I didn’t know what that meant, but you know it was fun). I’m sure you do, but in case you don’t, I’ve posed eleven questions for you to answer. Just follow this link.